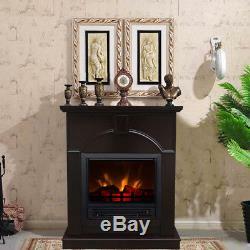 DECOR FLAME Electric Fireplace with 26 Mantle, Dark Chocolate. Electric Fireplace with 26 Mantle, Dark Chocolate. Can be used with or without heater. Home electric fireplace heats rooms up to 325 sq ft.
Dimensions: 25.98"L x 8.27"W x 34.25H. Classic electric fireplace model# M850P-26FDC. 26 mantle fireplace in dark chocolate. Any product you return must be in the same condition you received it and in the original packaging. We usually respond within 24 hours on weekdays. Thank you for shopping at our store. 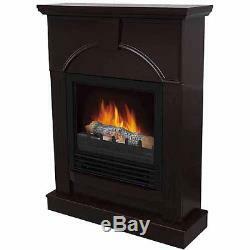 The item "DECOR FLAME Electric Fireplace with 26 Mantle, Dark Chocolate" is in sale since Tuesday, January 02, 2018. This item is in the category "Home & Garden\Home Improvement\Heating, Cooling & Air\Fireplaces & Stoves\Fireplaces". The seller is "gooddeals4u" and is located in US. This item can be shipped to United States.